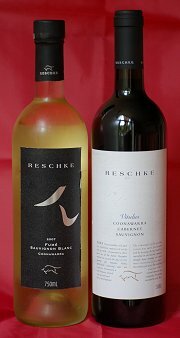 The UK importer of the Reschke family’s wines is Bancroft Wines, whose website reveals that the family celebrated 100 years in Australia’s Coonawarra last year, “where they started out as cattle graziers, while gradually converting the best plots to vineyards. The bovine heritage is celebrated in the Latin names of the wines, ‘Bos’ meaning ‘bull’ and ‘Vitulus’ meaning ‘bull calf’, but the attention to detail goes much further.” Indeed I was impressed with a tasting of the top Cabernet Sauvignon, ‘Bos’, last year, when I awarded the 2002 vintage 91 points out of 100. Winemaker Peter Douglas was Chief Winemaker for Wynns Coonawarra for 16 years. After Wynns, he spent several vintages in Bordeaux with Château Léoville-Barton, then in the Napa Valley with Constellation Wine Group and finally in Italy and Tunisia with Calatrasi before returning home to Coonawarra in 2001. He, Managing Director Burke Reschke and Viticulturist Mary Kennedy oversee vineyards which have grown to 360 acres, consisting primarily of Cabernet Sauvignon, with Merlot, Shiraz, Petit Verdot and Cabernet Franc, all cropped particularly low to achieve high quality fruit. When it is handled with some discretion I do love a ‘fumé’, or oaked, Sauvignon Blanc, a style that has fallen somewhat out of fashion. This is a beauty, made with ripe Coonawarra Sauvignon just lightly brushed with oak, and the bottle closed with a glass stopper. The pale gold colour leads on to a nose that mixes subtly tropical fruit with a sheen of creamy oak and a twist of something herbal and leafy. On the palate the ripeness of the fruit comes through with a peachy character, but there’s also a bright, pear and melon juiciness and good acidity, then just that background of nutty, sesame seed oak. Lovely stuff. 90/100. £11.50. Reschke says their ‘Vitulus’ Coonawarra Cabernet is ‘not oaked, but barrel matured,’ implying that the wood is not the dominating factor. Indeed only 15% of the wine spent time in new American oak hogsheads, whilst 85% went into older French and American barriques. From 2003, this has a dark, earthy crimson to black colour and a nose that has background traces of eucalyptus, mint and some cedar, and a solid black berry fruitiness. On the palate this is beautifully pitched, with a fine blood-streaked, gamy edge to sweet, nicely concentrated black fruit. It is medium-bodied, and spice and tobacco tones fill in towards the finish, with moderate acidity and a bit of peppery tannin adding support. It has moderate length, but stays composed, balanced and nicely poised all the way through in a wine that is drinking very nicely indeed. 90/100. £12.75.